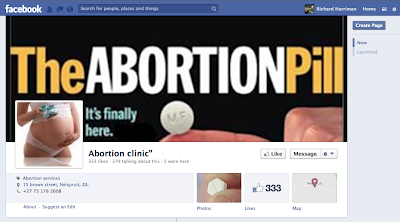 I contacted the crook, charlatan and idiot advertising himself on Facebook as the "Abortion Clinic". You'll recall that he offers to deal with "un wanted pregnancies,womb cleaning in a private enviornment". His spelling, not mine. It didn't take too much detective work to establish that he's not a real doctor at all. He's a traditional quack. Just to see what he was really offering I SMSed him and this was our correspondence. As you can see I lied about who I am. Sorry. And then guess what? He called! Realising that I probably don't sound much like a pregnant woman I grabbed Her Majesty and said, "You take this, talk to him!". I didn't know I'm married to an actress. Using her special sad voice she spoke to him and asked him how he could help. She told him she was 6 months pregnant and desperate to terminate. He told her that she should feel free to take the medication he would send her. So what was he sending her? So NOT a herbal concoction, he's sending the real thing. Well he says he is. Who knows what he really sends but let's assume he really does send Misoprostol. "UTERINE RUPTURE HAS BEEN REPORTED WHEN CYTOTEC WAS ADMINISTERED IN PREGNANT WOMEN TO INDUCE LABOR OR TO INDUCE ABORTION BEYOND THE EIGHTH WEEK OF PREGNANCY"
So our friend is peddling drugs, knowing that it's incredibly dangerous. But maybe he's just doing it with the best intentions? Not a chance. He's a crook and he knows it. I SMSed him asking if he was a doctor of medicine. This is his response. It speaks for itself. I was asked recently what I think about mob justice. I replied that I thought it was savage and unjust. But there are times when I can sympathise. The "Abortion Clinic" who advertised on Facebook is still there but I have a bit more information. 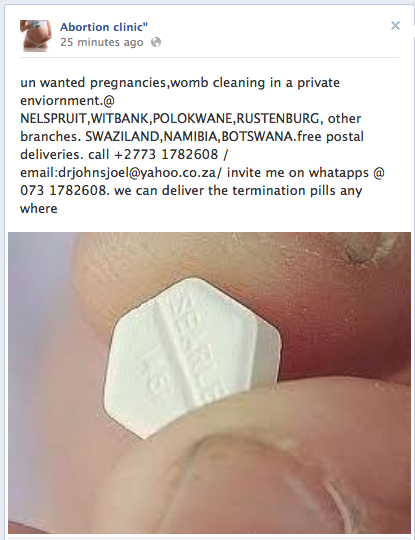 Maybe it's just a strange coincidence but these are the contact details for the "Abortion Clinic". And these are the contact details for "Lost Lover Sheik Tabu" who can also be found on Facebook. I think we know now what those drugs are. Herbal concoctions that are either useless or dangerous. Either way he's a criminal. Northern Port "University" is back. Still a scam. I am really interested to know if this Northern Port University is fake or not and I want to know if it is how can I claim them and get back my money. Thanks a lot. Northern Port is part of the Organization for Global Learning Education, a scam organisation started by a crook in Pakistan called Salem Kureshi. The fake establishments in Kureshi’s bogus empire also include “universities” calling themselves Belford, Panworld, Headway, Corllins, Ashwood, Rochville, MUST, OLWA and McFord. I contacted Northern Port University on the web and had the following chat with them. Max Pine: How are you doing Richard ? Max Pine: How may I assist you today ? Richard: I currently have a Bachelors degree in Psychology. How quickly can I get a Masters degree? Max Pine: If you go for PLA program you can earn a degree in 15 days time ! Max Pine: PLA ( Prior Learning Assessment ) is based on your prior experience, previous academic background, and the achievements that you have in the field till day, taking your past experiences into consideration we will convert your working hours into the college credits and that's how we will award you with the degree, without having you attend any necessarily courses or classes online. Richard: I've been working for 25 years. Max Pine: we can award you a degree on basis of your work & life experience! Richard: Wonderful! Do I need to send you my Bachelors degree certificate? Max Pine: what purpose you want to get a degree for ? Richard: To get a better job. Max Pine: better job employment ? or further education ? Max Pine: I will be needing some details so we can proceed further ! Max Pine: 1. Full Name. Max Pine: 3. Contact Number. Max Pine: 4. Alternative Number. Max Pine: 5. Email address. Max Pine: 6. Desired Package. (degree) in (major). Max Pine: 8. Complete Shipping Address (Physical Address). Max Pine: with shipping and handling $250.00 includes all your tax & expenses ! Max Pine: should we proceed ? Richard: So I don't have to sit any exams or do any coursework? Max Pine: no you don't ! Max Pine: degree will be awarded you on basis of your work & life experience ! Richard: Where is Northern Port University based? Max Pine: Standard fee is $598.00 but there is presidential scholarship discount available & your fee is dropping down ! Max Pine: Its an online University ! Max Pine: our administration office is located in Port Clinton Ohio ! Does that tell you everything you need to know? Lots of people have asked us about Go Direct Stock Market Investments, who have been actively seeking people to undergo their "training" on stock market trading. There are various curious things that spring to mind. If they only offer "training" why do they include the word "Investments" in their title? What qualification do their trainers have to dispense these skills? Do they have ANY evidence that they generate successful investors? And above all, are they anything like Stock Market Direct who turned out to be run by a crook who ran off with all the money? All I can do is urge caution. Extreme caution. Consumers have a right to judge the people who sell us things only by their actions. We shouldn’t judge them by their skin colour, their nationality, gender, age or sexual orientation, just by the way they behave. The good news is that people spread the word about companies that misbehave remarkably well. These days with tools like Facebook the abusive actions of a store in Gaborone can be known throughout the city, the nation and the world within moments. Just in the last couple of weeks I’ve seen posts on Facebook reporting problems with banks, restaurants, insurance companies, cellphone network operators, a wide range of companies. But not one about furniture stores and that confuses me when perhaps the commonest problem reported to us is store credit abuse. Do I really mean abuse? Is it that bad? Is there any evidence to suggest that furniture stores are abusing us? If only we had evidence of how store sell us thing on credit. In the last couple of weeks some of our undercover mystery shoppers visited a variety of furniture stores in Gabs. Our team is a mixture of people, some young, some older, some men, others women, fairly typical of the sort of people who buy furniture and kitchen equipment on credit. Their task was to visit stores, pick an item or two and ask about buying them on credit. Their assignment was to test how much information they were given by the store. Did the store staff mention the total amount they’d pay? Did they suggest buying for cash instead? Did they mention and explain the insurance cover the store might offer them? Did they explain the risks of buying on credit? Did they explain the contract they would be asked to sign? Most importantly, were they given a copy of the contract to read before signing it? To begin with all the stores explained the payments we’d have to make. They described the deposit, the amount of each instalment and the number of instalments needed. But not all of them then told the customer how much this would come to. That’s probably because they didn’t want to make it clear to the potential customer that the total credit price is sometimes double the cash price. Obviously none of the store staff told our team to think again about buying on credit and saving up instead. But you wouldn’t expect them to, would you? Unfortunately very little information was given to our mystery shoppers about the risks of buying on credit. Nobody tried to address the biggest single misunderstanding that consumer have about buying on credit. What happens if you fail to make payments and the goods are repossessed? Most consumers think that if this happens the entire deal is over and that they can walk away from the deal. This simply isn’t true. Even though you don’t have the goods any longer, you still owe the store lots of money. The fridge or sofa you bought on credit, at perhaps twice the cash price is now worth just a fraction of the cash price, leaving perhaps a massive outstanding balance still to pay. 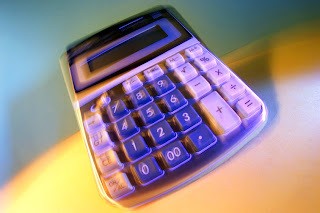 You can easily still owe most of the total credit price and then penalties and legal fees on top. None of the stores explained this, not one of them even mentioned the issue. It’s obvious why. Many store credit schemes come with insurance policies and this was something else we wanted to know about. Curiously only a couple of the stores mentioned their insurance policies, which seems strange if they are of such benefit to consumers? The reason they didn’t explain them is obvious. These insurance policies aren’t for your benefit at all. They exist to protect the store, not you. They insure your debt, not your possessions. Not one of the stores explained what the policy actually covered. However the big problem was the contract the store wants you to sign. This is where things switch from being sharp business practice to being abuse. Each of our mystery shoppers asked very politely to see a copy of the store credit agreement they would be asked to sign. On every occasion, in every store, without exception they were told “No”. They were told that they would only be able to SEE the agreement when they were given it to sign. any facts, results or opinions expressed or implied. But store credit is despicable, trust me. Why? Why are the stores so scared of showing their potential customers the contract they want them to sign? What are they trying to hide? Despite what some might think, I can’t read people minds. I don’t know for sure why you and I aren’t allowed to even read the contract before they ask us to sign it but I can guess. I suspect it’s because they don’t WANT us to read the contract. They don’t want us to know what it says. They want us to be ignorant and easier to abuse. They are also don’t want us to see some of the clauses in the contract, like the ones that say that I agree that the goods were in perfect condition when they arrived, before I’ve even left the store, days before the good are actually delivered. That’s why you’re not allowed to take a copy of the contract away with you, to keep it overnight, to show it to your partner or parents. They’re absolutely terrified that you’ll read it. The lesson is simple. Furniture stores are not really furniture stores. They’re moneylenders. Their only interest s to lend you money at exorbitant rates and then screw you for every thebe when things go wrong. Do not buy things on store credit unless you want to be a victim of abuse. I hope you will be able to help me as u have helped others. My boyfriend sent me a parcel from the UK. I paid for most of the charges demanded but they’re now asking for security charges which I can’t afford. They now demand payment for storage because they still have the parcel. What can I do in this kind of situation? I’m terribly sorry to give you bad news but you have been the victim of a scam, there's no doubt about it. Firstly there’s no such thing as an "anti-terrorist certificate" required by the any authority around the world. The only time you’ll hear about such a thing is from scammers. Also real courier companies use their own email domain, not a free domain like this company does. Real courier companies can also spell correctly. The emails you sent over were riddled with spelling mistakes, which is not what you would expect from a genuine company in the UK or Malaysia. Also, genuine companies use landline numbers, not a redirectable British cellphone number like these people. Real companies transfer money using bank-to-bank transfers, not Western Union. 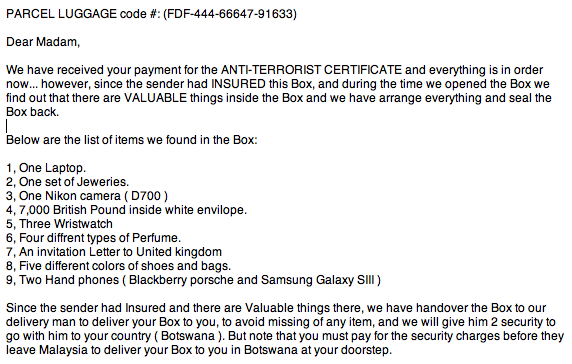 There is, of course, no trace of this courier company in Malaysia, who also operate only using cellphones. 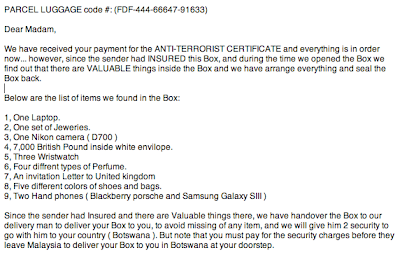 And above all, why would a package travelling from the UK to Botswana go via Malaysia? Unfortunately nothing about this is real. The courier company is a fake, the package is fake and your “boyfriend” is fake. He doesn't really exist, his identity is just part of the scam. Unfortunately your money has gone, never to be seen again. How true can this be please? It's a mixture of truth and partial truth. Dialing *#06# IS one way to find out the “International Mobile Station Equipment Identity” or IMEI number of your phone. This is a unique number identifying your phone and can be very useful in blocking your phone if it’s stolen. Everyone should record the number somewhere safe just in case. It probably won’t help you get your phone back but it can stop a crook using it. Many phones also have other ways of telling you the IMEI number. However the email bit is no use at all. The email address is actually that of the Commissioner of Police in Chennai and he or she is unlikely to be able to help you and me. Unless we find ourselves in Chennai of course. This is perhaps one of the scariest things I've seen on Facebook in ages. Where do we begin? We have no idea what the pill actually is, he's operating from a Yahoo address, a cellphone number and WhatsApp and he's posting what he claims must be potent pharmaceuticals across our border? Be warned. This is NOT the way to deal with an unwanted pregnancy. An initially depressing article in The Economist on aviation ("Going South") in Africa gets interesting towards the end. "FastJet, a Tanzanian airline part-owned by Sir Stelios Haji-Ioannou, the founder of easyJet, is ploughing on regardless. The company hopes to receive government approval for the takeover of two defunct rivals, and then to expand throughout southern Africa. For this strategy to work, the region’s governments will have to abandon protectionism and open their airports to all comers, both foreign and domestic. Politicians need to respond positively and quickly if they want to support business and tourism in this airline graveyard." I've had fantasies for years of Stelios, a business hero of mine, coming down here and cleaning up the airline industry. Fingers crossed! TVI Express - the founder behind bars? Tarun Trikha, the crook behind the TVI Express pyramid scheme has new accommodation. According to the Daily Mail India Trikha was arrested when he arrived at Delhi airport, following charges laid against him by a variety of victims. "A lookout notice was issued for him since he was on the run since 2011. He was arrested at the Delhi airport while trying to flee to Nepal," said Syed Waqar Raza, special superintendent of police, West Bengal CID. There's a even a report that his entire family are under investigation for their role in the fraud. It's just a shame it's too late for his various victims. It's a shame that the the people running the scheme in Botswana weren't all made to pay back the money they knowingly took from other victims. It's also a shame that the authorities in Botswana didn't follow the examples of their cousins in Namibia, Lesotho, the US State of Georgia, Indonesia, Australia and South Africa and DID something to protect their people. "Knowingly"? Isn't that going too far? They knew they were involved in a scam? They didn't recognise a pyramid scheme when they saw it? When they were involved in it? When the clues were so obvious that it was a scam? Even to the TVI Express recruiters here in Botswana like the ones that appeared on radio opposing me and proceeded to lie, distort and makes fools of themselves. 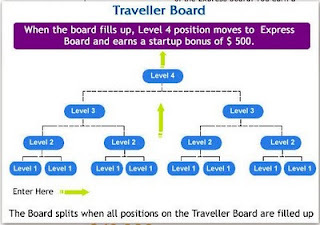 Which part of this does NOT look like a pyramid scheme? The tragedy is that are no doubt TVI Express organisers still out there imagining that they'll get their money and effort back somehow. "No, we can't fix it, it's water damage." Here's a tip for those occasions. So next time they say this, remind them of The Law and demand a full technical report, substantiating their claims. Our good friends at Letshego have a new service. "Letshego now finances UK imported cars through approved dealers. All you have to do is identify the car you want through our approved dealers, bring a proforma invoice, apply for a Letshego Motor Vehicle Loan, and we will handle the rest"
Let's ignore the fact that buying a car like this is incredibly risky. You're buying a car you've never touched, never sat in and never test-driven. A car you pay for up-front and for which you get NO GUARANTEE of quality or suitability. So who exactly are these "approved dealers"? We called Letshego this afternoon and asked which dealers we can use. Would that be Trans Africa Vehicle Exports, who are currently represented in Botswana by "Westridge Holdings"? The company whose representative here lies to customers? The same company who promises refunds to his customers when he's delivered THE WRONG CAR and lies when he does so? The same company that stalls, prevaricates and LIES? So far we've heard from five different customers who've been abused by Westridge Holdings. They simply can't be trusted. P.S. Trans Africa Vehicle Exports IS a registered company in the UK, Company No. 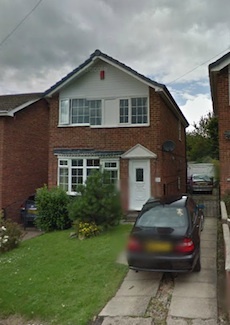 08051174, registered at 26 Cliffe Park Crescent, Leeds, West Yorkshire. It’s not just the scammers from Eurextrade, Oil of Asia and Three Link Connection that talk nonsense. Reputable companies do it as well and they think that gives them some rights over us. Furniture stores are a very good example. The contracts you sign when you buy things from them on credit contain some staggeringly nonsensical things. I once saw a contract that contained a clause saying that the goods had been inspected and had been found to be in perfect condition. The customer had to sign this in the store a week before the over-priced junk had even been delivered. So even if the goods were delivered smashed to pieces the victim, sorry, I meant customer, has already put in writing that they’re fine. They’re committed. Of course no court would ever enforce this, the credit agreement would have been dated a week before the delivery receipt, it would be seen as nonsense but I bet the store would exploit the situation as much as possible, don’t you? Another clause in the same contract said that the customer had read the contract in full, understood it completely and promised never to say anything to the contrary. And someone who actually didn’t understand the contract would be able to understand that bit? It’s utter nonsense and clearly an attempt to abuse the person giving the store his or her money. Unfortunately that’s fairly typical of certain stores. What’s worse is that most furniture stores don’t even allow their customers to see their contract before they sign it. Yes, that’s true. You’re not allowed to read the contract until the time you’re asked to sign it. Read this column next week for evidence of this. We saw another case more recently, this time with a cellphone company. A reader had taken a cellphone back to the store to be repaired. It was still under warranty so the repair was going to be free but the company still wanted to make the customer’s life difficult. When she took the phone back they gave her a receipt. So far, so good. Then she noticed what it said at the bottom of the receipt. That notice is profoundly silly. If a document is not to be shown outside of Mascom then why do they give it to their customers? Why do they even show it to them? What are they going to do to the customer who showed it to me? I think they should sue her, prosecute her for something, I have no idea what, perjury, treason, murder, something serious enough to reflect the gravity of her crime. What exactly is so important about the document? Does it contain State secrets? Does it reveal who shot JFK? Does it show how much money cellphone companies make from prepaid customers? The only possible thing on the receipt that might be controversial is one part where the customer agrees that an “Out of Warranty” repair will have “a minimal charge of P1380”? More nonsense. Finally there are my personal favourite bits of nonsense. Email disclaimers. You know, those bits of text in tiny writing at the bottom of an email from a big company. Have you ever read them? I know most people haven’t but I’m a disclaimer nerd, I love them. They’re hilarious. But this was at the END of the email, AFTER you’ve read it. This bank wants you to read the end of the email first, then read the content to decide if you are indeed the intended recipient and then, if it turns out you’re not, then somehow undo reading it. Nonsense. Another, a parastatal, includes this statement: “You may not copy this message or disclose its contents to anyone else.” Why not? It’s mine and I can do whatever I like with it. You sent it to me, whether you did that deliberately or accidentally doesn’t matter, it’s now on my computer and it’s mine. A couple of years ago Hyundai threatened to sue us for criticising their dealer in Rustenburg. I’d published part of the contents of one of their emails to me and their lawyer claimed that “this publication was unlawful as you ignored the disclaimer and confidentiality notice on the emails”. I didn’t hear from them again. Finally, the most hilariously silly disclaimer comes from my bank. Their emails say that if you want to read their disclaimer you have to visit their web site. So I have to go out of my way to read some silly restrictions on what I can do with the email you sent me, the one that I now own? I think you should do the same. Tell companies where they can stick their nonsense. And then take your money to a company that offers less of it. In November I sold my 2002 Toyota Corolla to a car dealer for P40,000. The agreement was that they will pay me in installments. I received a cash total of P3,000 the same date and got four cheques which I was supposed to cash at the bank or deposit them on the dates specified on the cheques. The cheques were signed by the owner in my presence. I deposited the first cheque which was later sent back to me because of no funds in their account. In December I called the owner and told him that I will go and cash the second cheque on the 3rd January and asked him if there was money in the account and he told me to go and cash it. However that cheque bounced as the manager told me that the contact person I gave him told him that he does not know anything about the cheque. I then went to the dealership and found two other guys who told me that the owner is out of the country. They gave me P5,000 cash. Later during the month the owner told me that he did not have money and he will pay me month end. I kept on checking him till Easter week when I went to meet him as he promised me that he will get a car for me as per the agreement we got into since he was failing to pay me. On that day he told me that his brother went to buy cars and they will be here first week of April. Eventually he promised to give me the car or money on the 10th April. On that day I called him and he told me that he does not have the car nor the money and asked me to give him another 2 weeks. I told him that I won’t allow that since every time I come or call him he makes excuses. I am hoping that you will be able to assist me. Giving someone a cheque that bounces is a serious crime. Maybe a visit from the cops will encourage your dealer to do the decent thing? Last year around March/April/May I lay-byed winter clothes at a store. Later on I went to the store to clear the lay-bye with P150. I was paying by credit card, and the sales rep swiped my card and took P150 which reported on my phone. While still there he told me he entered the transaction as cash not credit card. I was told by the manager to go to a machine and get another P150 cash so that they can finish their transaction which means they took P300 from me. I was told they will reverse the first transaction of P150 that they took. I was given a week to wait for my money but it took long than they said. I went back to the store time and again but with no progress. The manager told me they reversed the money back in my account but there was nothing. They referred me to FNB to get a statement which I still have but with no money in my account. Please help! How generous are you feeling towards this store? Their incompetence has cost you money and there are two ways of getting it back. The generous approach is to go to FNB and complete a Visa Dispute Form and they can go through the motions but that could take weeks. The alternative is to go back to the store and demand they give you back the cash they took from you. A manager should authorize that on the spot. It’s only P150 after all, that’s nothing to them. We’ll get in touch with them to see if we can speed things along a bit. Many celebrations this week. A reader celebrated Graham and his staff at Cappuccinos for a great birthday evening celebration. Another celebrated Poloko at Wimpy in Rail Park Mall for friendly and attentive service. Someone else wanted to praise Davis from Village Spar, saying that David makes her “feel like there is hope for the service in Gabs!” Yet another reader celebrated the team at Indian Spur at Airport Junction AND the team at Apache Spur at Riverwalk for creative solutions when they had phone problems. Finally Gosego and Jacqueline at Water Lily Lodge in Kasane were praised for their “warm reception” and “world class approach”. 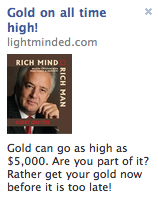 I hope nobody followed the "advice" seen in many Facebook advertisements to invest in gold? You don't invest in gold when it's at an all-time high. You buy when things are cheap, you SELL when things are at the highest price in the history of the world, as they were a few months ago. Now the price has dropped and people are panic-selling your "investment" will be a disastrous one. "The price of gold has had a remarkable run in recent years, hitting a record high of $1,800." "David Govett, head of precious metals at Marex Spectron in London, said there was a mass flight out of gold: 'We have seen massive liquidation from all quarters... This is a market that has only got one thing on its mind... get me out.'" NY Times - "Sometimes, We Want Prices to Fool Us"
An interesting piece from the New York Times on shopper psychology, "Sometimes, We Want Prices to Fool Us". "But most shoppers, coupon collectors or not, want the thrill of getting a great deal, even if it’s an illusion. 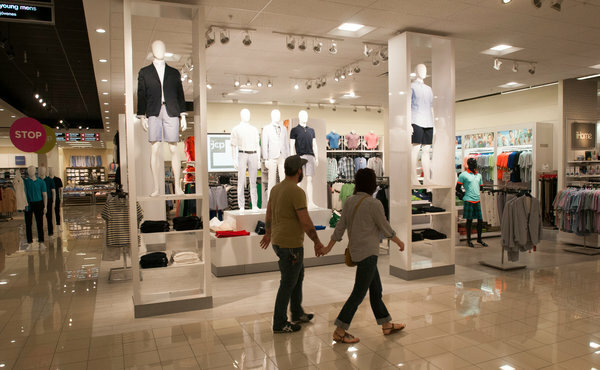 In recent months, Penney recognized that human trait and backtracked on its pricing policy, offering coupons and running weekly sales again. And it started marking up items to immediately mark them down for the appearance of a discount." Yesterday's Mmegi did a front-cover story and a whole lot more on Eurextrade and its aftermath. You don’t have a right to completely free speech. No, honestly, you don’t. Oliver Wendell Holmes, an American Supreme Court judge once said in a ruling that the “most stringent protection of free speech would not protect a man falsely shouting fire in a theatre and causing a panic”. In other words there are certain things you can’t say. Our freedom of speech is limited. You’re not allowed to shout fire in a theatre if there isn’t actually a fire. We’re simply not allowed to say things that will cause panic or that may cause death, injury or civil disturbance. Holmes went on to say that the decision is “whether the words used are used in such circumstances and are of such a nature as to create a clear and present danger”. I think we’re surrounded by the abuse of free speech every day. I think that some of this speech presents a clear and present danger to our wealth, and more importantly to our health. 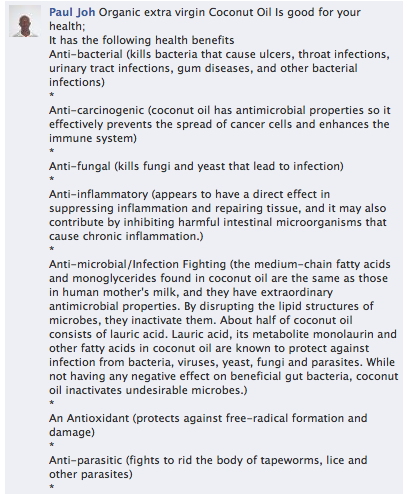 He later claimed that his coconut oil and cream could aid with all sorts of things including heart health, “creating hormones, maintaining hormonal balance”, “cellular health”, “balanced cholesterol levels”, claimed that it “kills bacteria”, possesses “anti-carcinogenic” properties and protects “against infection from bacteria, viruses, yeast, fungi and parasites”. He continued to say that it “kills viruses that cause influenza, herpes, measles, hepatitis C and other viruses”. I say “offensively” because there are few types of people I despise more than peddlers of cures for HIV infection and AIDS. They are lower morally than the creators of the Eurextrade Ponzi scheme, psychics and TV evangelists. They are the absolute lowest of the low. Paul on Facebook is one of this group of low-down scumbags. Let’s state the obvious in an obvious way. If even some of his claims about coconut oil were true then there would be people with Nobel Prizes for Medicine as a result. There would be people with Nobel Prizes for Peace as well. There would be accolades, knighthoods and medals in abundance. There would be faces on postage stamps, statues and wings of universities named after the discoverers. Most significantly pharmaceutical firms would be buying up the patents as well as purchasing every coconut in the world. I must have missed all of these things. Or maybe it’s all a staggeringly flagrant and audacious lie? Maybe Paul and his fellow liars are all lying liars? I think we should be doing more about people like Paul. 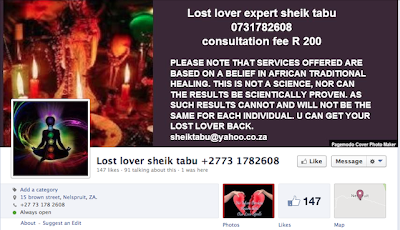 I pointed out on Facebook that his “advertisements” are illegal in Botswana. Sections 396-399 of our Penal Code specifically outlaws advertising medicines and treatments for a variety of conditions, including cancer, heart disease and, by implication, HIV and AIDS. It’s simply illegal. Luckily his ridiculous comments were all very quickly removed, presumably because illegal claims aren’t popular on Facebook. But I’m sure he’ll be back again elsewhere very soon. But who will enforce this law that protects us against people offering miracle cures? Technically it’s the Police. Someone would need to lodge a complaint and request the cops to investigate. But we all know that’s probably not going to happen, don’t we? We’ve all read stories of so-called traditional healers being arrested and even of a few who’ve been deported but not nearly enough. What about the other group who threaten not our health but our wealth? The pyramid and Ponzi scheme scammers who steal so much of our money? The people behind Eurextrade, Three Link Connection and Oil of Asia. Who can deal with them? The Bank of Botswana can play a role if they think that someone’s running an “illegal deposit-taking scheme” but the scammers get around this often by requiring the deposits to be made overseas. Eurextrade and Oil of Asia have bank accounts in far-away countries and the crooks from Three Link Connection required their victims to cross the border and pay their money into banks in Zeerust. That makes it difficult to police. To their great credit, our friends at NBFIRA, the Non-Bank Financial Institutions Regulatory Authority, are doing their best. Even though it wasn’t technically their business they placed adverts in many of the local newspapers warning people against Eurextrade. With luck that warned some people and maybe they got out in time. Maybe. NBFIRA’a example is a good one. They were concerned enough to get out and warn the public and they deserve great credit for that. It’s just a shame that other agencies, other Government departments aren’t doing the same. In fact it’s much more than a shame, it a danger, it’s a clear and present danger. People are shouting fire in a crowded theatre and the agencies empowered to stop people doing that are sitting idly by. I know of one person whose health and wealth were both damaged by Eurextrade. He sold two houses and a car to raise the money to invest in the scheme. When he began to see stories that the scam had finally fallen apart he collapsed and ended up in hospital and as far as I know he’s still there. How many more people do we need to be damaged before the authorities take action to prevent rather than just apologise afterwards for their lack of action? Correction. None of them have apologised yet. That’s their shame. I would like to get an advice from you concerning one of the motorbike dealers in Gabz as a matter of an urgency as I have already written them a communication that I am returning my motorbike to them for refund should they not attend to the bike problem I long reported. I am unsure if the action I intend to take against them is a "right" that I am entitled to as a customer. You have a right, as expressed in the Consumer Protection Regulations to goods that are “of merchantable quality”. This is defined by the Regulations as “fit for the purposes for which commodities of that kind are usually purchased, as it is reasonable to expect in light of the relevant circumstances”. You don’t mention what is actually wrong with your motorbike but I assume it is a problem serious enough to stop it working reliably? If this is the case you have a right to one of the 3 ‘R’s. A refund, repair or replacement. However it is up to the dealer to decide which of these they offers to begin with. It’s reasonable to allow them to try and fix whatever the problem might be. It’s only when that fails that you are really entitled to demand either a replacement or a refund. Most suppliers will try and avoid those because of the costs involved but eventually they might have to. Send us the details and we’ll get in touch with them and see if we can’t get them moving! I have an issue with a furniture store. I bought a fridge on higher purchase, paid it for 4-5 months then I failed to continue with the installments but I communicated with them that since I can not afford to pay anymore they should come and get the fridge back. They did so and took it. Now my problem is they have blacklisted me at ITC saying I owe them 7000, is that fair? 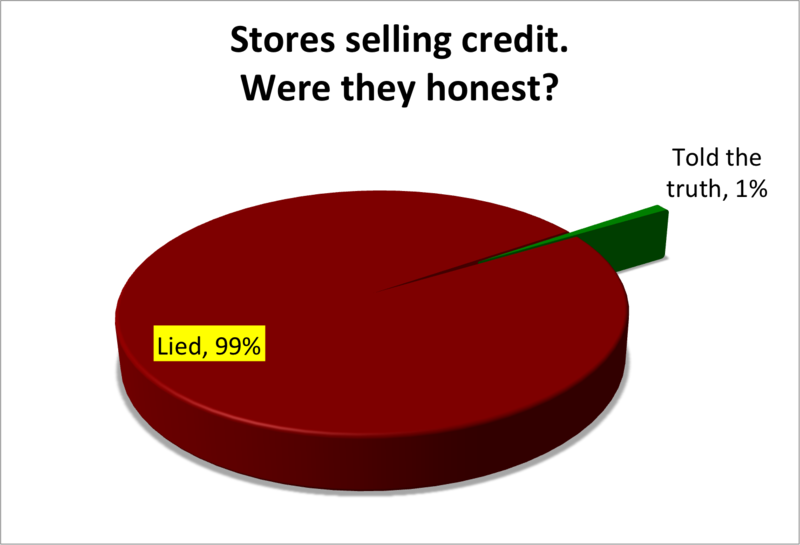 Perhaps the commonest problem we have reported to us is store credit. So many times it goes wrong, leaving consumers confused, unhappy and poor. This is a very good example. There is a very simple thing that everyone needs to understand. When you sign a store credit agreement you are committed. No matter what happens you will owe the store money and you will not be able to escape that debt. EVEN IF YOU RETURN THE GOODS. You didn’t mention how much you paid for the fridge but let me make some assumptions. If you buy a fridge worth P4,000 the total credit price will probably be at least twice that price, let’s say P8,000. The monthly installments will probably be about P330. Let’s say that you pay for just 5 months, repaying a total of P1,650. That still leaves a balance of over P6,000 that you owe the store. If they then collect the fridge they’ll sell it second-hand and if they’re lucky they’ll get P2,000 for it. Remember that the actual cash value of the fridge five months ago was only P4,000. That means that even though your fridge has been taken away, you still owe the store at least P4,000, more than the original cash price of the fridge. What’s more, if that outstanding amount of P4,000 stays there long enough the company is also entitled to add interest on top so it’s perfectly possible that you might now owe P7,000. I suggest that you speak to the store and ask for a full statement of the debt and it’s current status. You then need to sit down with whoever owns the debt to work out a payment plan and see if you can get your ITC record cleared. The lesson is simple. Store credit is the quickest way to make you extremely poor. As many people will know I have contempt for people offering miracle cures, particularly those for serious disorders like cancer, heart disease, diabetes and, most importantly of all, HIV/AIDS. 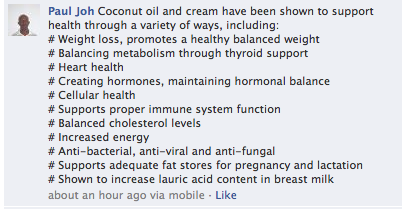 On Facebook recently some remarkable claims were made for coconut oil. And then the big one. The big lie. 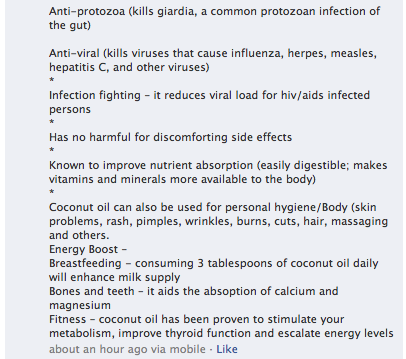 As far as I can establish, there is no credible scientific evidence that coconut oil can offer any of these health claims. While it might be good for your skin, it's not a miracle cure. If it was, people would have earned Nobel Prizes for medicine by now. The Eurextrade scam continues to make people suffer, ever after it’s collapsed and gone away. We heard recently about one of the “investors” in Eurextrade who had gone as far as selling two houses and a car to raise the money to invest in the scheme. When he began to see stories that the scam had finally fallen apart he collapsed and ended up in hospital and as far as I know he’s still there. Another victim. I don’t know him but apparently he’s an older gentleman and the houses were his retirement fund. He’s a sensible guy who knew that investing in property is a safe bet but a fool for giving his hard-earned investment to a scheme that promised “up to 2.9% per day”. Presumably he’s now a poor and unwell senior citizen, not someone enjoying the comfortable retirement he deserved. The unfortunate truth is that scammers like the crooks running Eurextrade and their local representatives who so willingly recruited other victims don’t offer refunds. The money is gone, never to be seen again. Luckily the names of the local reps are still online if you know where to look to find out who can’t be trusted. Unfortunately scams are like the flu, new variations are constantly appearing. As we become immune to one another mutation emerges. One of the latest calls itself “Oil of Asia”. On their web site they make some remarkable claims about the money you can earn, promising “3% Fixed Daily Profit for 75 business days”. They describe themselves as "one of the leading investment companies globally with financial activity conducted in oil market, Oil of Asia Ltd is a truly recognized for its excellence in customer service and tons of satisfied customers in more." Can you tell that English isn’t their first language? So no real clues there, just the usual meaningless waffle you get from all Ponzi schemes. “you know I can take you to court for this, I can easily trace you, I think you know this can turn into a nightmare for you, don take me for granted”. Like I said. A thug. But that’s just a pack of lies. Three Link Connection is a scam, a fraud, a deception. They take your money, pretend they’re going to invest it in cheap Chinese products and then come up with endless excuses about why you’re not getting your money back. So we went along. Unfortunately it didn’t go well. When we first introduced ourselves the organisers were a little taken aback. After a quick huddle they asked us to leave as they said “this is a private meeting”. Within minutes the meeting was adjourned. We could see the organisers telling their victims that something had happened and that the meeting was off. As they were all leaving one of the organisers, "John", came over to me and said he wanted to talk some more at our office about Three Link Connection. He flatly denied that it was a scam and agreed with Daisy Mogale, the person at the top who I spoke to a couple of months ago. She told me then that “They’re all liars! All of them in Botswana are liars!” when I mentioned the number of complaints we'd had. John even claimed he was with Daisy when I called her. So we'll see if John gets in touch. We'll see if he wants to put his side of the story. We'll see if any of the "investors" ever get their money back. I doubt it. Like I said earlier, scammers don’t offer refunds or apologies. They just steal people’s money and ruin their lives. Last minute update. Rumours are spreading that Oil of Asia has already had its accounts blocked. Watch this space. In December 2012, I made a lay-be for a pair of shoes at a shop in Game City Mall, Gaborone. As per the receipt issued to me, I was told my lay-bye expires on the 31/03/2013. With that in mind, on the 28/03/2013 I made my way to the shop to collect my lay-bye, where I was told by the store clerks that my lay-bye has been put out of the store room and put back in store to be sold. Unfortunate for me my shoes were bought by another customer. The said these orders came from the store owners in South Africa. I would like know the steps I can take against the shop and also why I was not made aware of this. Usually when any of my previous lay-byes were about to expire I would receive an SMS alert, please explain why a similar courteous SMS was not sent to me. I'm sorry to hear of your problem. The store has clearly mistreated you and you have every right to feel abused. However I suspect it would be difficult to force the store to give you the shoes if they've sold them to someone else. Nevertheless you are clearly entitled to a complete refund of the money you paid, as well as an apology. You had an agreement with the store and they broke it. They should at least say sorry, after they’ve given you back your money. I’ll get in touch with the store and encourage them to get moving. Even if it’s a decent apology it’ll be a start. Maybe the owners will remind their staff about contracts, promises and decent service? I bought a Lenovo laptop on the 9th August 2012 on credit. This agreement is to end after 24 months with this month being the 8th month. I bought this laptop with the hope that it will last my entire years of studying as I trusted the quality that I was promised by the store. In February I noticed that the laptop had lost a screw from beneath it which I found and replaced. Earlier this month I encountered the same problem but only this time I did not manage to find the screw and so I decided to take the laptop back to the shop to alert them of the problem. When I got there it came to my attention that the shop knows very well of the manufacturing fault of the laptops having the tendency of losing screws. When I asked why the shop would sell such faulty laptops the shop assistant told me that they can only take the laptop for maintenance as it is still warranted. I found this very disturbing as I do not have the assurance that even after the maintenance the laptop won’t continue losing screws. Also I am afraid that the store might charge me for the costs incurred in fixing the broken points of the laptop which were as a result of it losing screws. Please follow this up and advice me on what to do as I now feel I’m am going to have to pay for a laptop that will incur more costs for me because of its low quality that I was not aware of when I purchased it. I think this is quite a simple situation. Take the laptop back to the store and let them fix it. If, as you say, there has been damage as a result of the screws coming loose then it’s their job to fix it under the terms of the warranty. 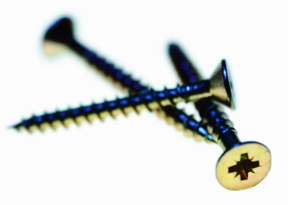 I found online a number of reports of Lenovo laptops losing screws just as you describe. Clearly you’re not the first person to have this experience. You should remind the store about this. Let me know how they react. We heard about Neo, an employee of Choppies in Mogoditshane who we’re told “is a super star” who offers “superb customer service”. Another reader told us about Moeng at the Total filling station at Game City for “being helpful and knowledgeable”. Finally we were told about Candy at Debonairs at Rail Park Mall and her “beautiful service and smile”. Well done to them all! "I am one of the people who have invested in this company. I lost a lot of money and am still struggling to get up after that blow. The people who were at the 'top' who all along had no answers for us have suddenly called a meeting to be held on Sat 23 at Wimpy western Bypass at 11 am. If you can, plis attend so you can meet the people who misled Batswana and maybe hear what empty promises they will be giving us this time around or another scheme to get more money from us. I am hoping you will come even if you 'told us so'......"
Unfortunately it wasn't that simple. I introduced myself to someone I thought might be involved and he confirmed I was in the right place with the right people. However he and another guy were very concerned that I had been invited. It was "a private meeting" they said. it was made very clear I wasn't welcome. So I had a coffee and watched through the window. After they had a hasty conversation they all suddenly left. One of the organisers, "John", came over to me before he left and said he wanted to talk some more at my office about Three Link Connection. He flatly denied that it was a scam and agreed with Daisy Mogale, the person at the top who I spoke to a couple of months ago. She told me then that “They’re all liars! All of them in Botswana are liars!” when I mentioned the number of complaints we'd had. John even claimed he was with Daisy when I called her. P.S. No, I don't feel bad abut taking their picture. "John" took plenty of me as well! "The meeting was moved from Wimpy to a venue in Mogoditshane. The meeting organizers were not happy that someone had invited you. Anyway the bottom line is we are expected to give them more money to release our initial investment money. The Mogoditshane meeting was very chaotic and the details were not very clear as the organizer was not given much chance to explain how this was going to work." That's a fairly common scam tactic. Once you've scammed someone and stolen their money you do your very best to get even more out of them. At least this group of victims seem more savvy now!